Every few months or so, my husband and I sit down to discuss our finances to make sure we’re still on the same page and that things are running smoothly. Luckily, things are typically on track, but it’s never a bad idea to look at your overall financial situation to see if some changes need to be made to your spending, budget, or even your goals. 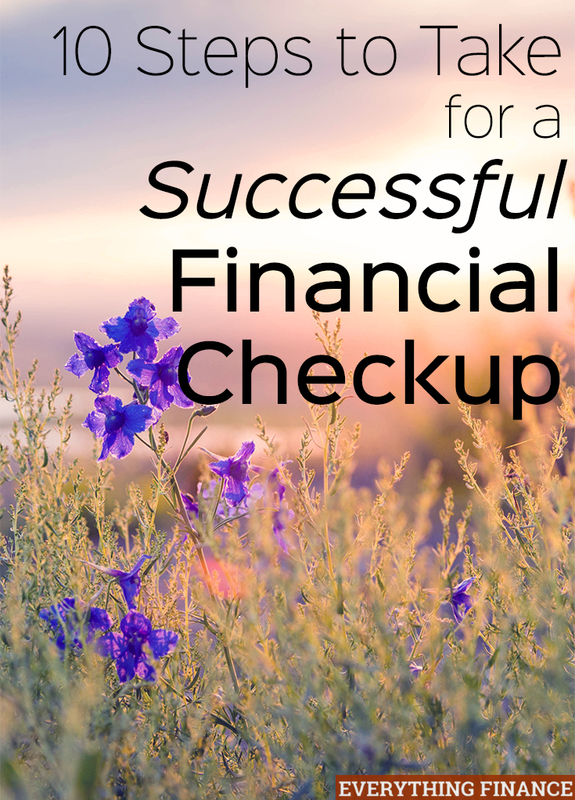 If you need some tips on how to conduct a successful financial checkup, go through the following 10 steps. You’ll gain more clarity on what you need to do to get where you want to be by the end! If worrying about retirement isn’t your thing, at the very minimum, contribute to your company’s match if one is available. Each year after that, try to increase your contribution by at least one percentage point. One percent is such a small change, you’re not likely to notice it missing from your paycheck, especially if you get a raise every year. If you can’t seem to meet the company match, start a retirement plan and contribute to it, even if you only have 50 bucks a month to spare. Every day you delay this important step is another day lost. Retirement savings snowball, so start that snowball now instead of later. Is every line item on your budget working for you? If you’ve had a few months where something just didn’t seem to work, review your records to find the problem and fix it. If that means increasing your grocery budget but decreasing your entertainment budget (or vice versa), then make that change. After all, that’s what budgets are for, so make yours work for you. While reviewing your budget, pay attention to where your discretionary funds are going. Do those expenses align with your values? Are you spending your money where you truly want to be spending it? For example, if you still think you spend too much money on clothes while you have a closet full of unworn clothing and shoes, think about adjusting that mall habit to focus your money elsewhere. Maybe you could spend on a date night out with your significant other instead of a new pair of boots. Either way, just be honest with yourself and decide if your spending habits are working for you. Value based spending is important because it keeps you from spending money on unnecessary stuff. If your spending habits don’t reflect your priorities, then you’re wasting money on things that don’t make you happy. Figure out what makes you the happiest, whether it’s travel or different experiences, and allocate your money to those areas. It may not sound very exciting, but unless you’re married to a billionaire (and most of us aren’t), then it’s important to check in with your spouse about your budget and spending habits. Is everyone happy? Does anything need to be changed? Do you want to talk about saving for a vacation fund? It’s true that talking about saving money may not sound very fun to most people, but taking that vacation you talked about saving for will be pretty fun when it finally happens. You can’t get there without discussing it first. It’s also pretty great to be one half of a couple who never fight about money because you both have set budget plans and financial goals. And the only way to get there is to talk about it. Hopefully you already have an emergency fund for things as big as a job loss or as small as the hot water heater going out. If you don’t have one started already, start one today. If you already have a retirement account, then you’re in great shape. Now it’s time to think about opening a taxable retirement account as well. If the thought of investing intimidates you, there’s a wealth of information online and at the library to help you get started and learn about the market. The easiest way to get started is to invest in index funds, which are low-cost and low-risk because they follow the market. You won’t get rich quickly, but your money will be relatively safe. Plus, you’ll earn more through compound interest the longer your money stays in the market. Review your long term goals and make sure you’re still working toward them. Do you still even have the same goals in mind? It’s okay if they change over time, just make sure everyone is still on the same page and that your goals align with each other. Tracking your net worth is a surefire way to see if you’re making progress towards those goals, so if you don’t already, start tracking it now and updating it every quarter. Keep your results so you can compare them to see how you’ve grown financially. Cable television is not only ridiculously expensive, but also a huge waste of our most valuable resource — our time. Getting rid of cable is definitely good for your wallet, so consider if cutting the cord is right for your home as well. Spending less time in front of the TV will allow you to spend more time where it counts, such as spending time with the people you love or starting a side hustle to earn extra money. The possibilities are endless. Quit wasting so much time in front of the TV and watch your happiness and productivity levels increase. Downsizing has become a big trend in the past few years. We really don’t need much in the way of things and space, and reducing your household “stuff” is good for the environment, your wallet, and your well-being. If you can’t downsize, at least try to declutter. It feels good to let go of so many things. It’s easier (and faster) to clean, and it allows you to breathe easier in your home. It also saves you money and time in maintenance and storage costs. It’s important to make time every now and then to review your finances. Don’t get on autopilot and assume everything is going well. Make financial checkups a regular part of your financial routine. Do you review your budget and investments regularly? Do you and your spouse both share financial responsibilities in your household? We go over our finances once a week. This has truly been a game changer for us. It is also important to have a will no matter of your age. Once a week is great. It’s so important to be on the same page when it comes to your finances and regular reviews ensure there are no surprises.